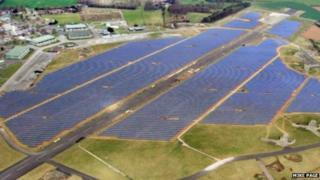 A giant solar energy farm generating 32 Megawatts of power has been unveiled on the site of a former RAF base. The Scottow Enterprise Park, located on the former RAF Coltishall airbase, in Norfolk, is now generating enough renewable energy to power 10,000 homes. The £50m solar farm will also generate income for Norfolk County Council who bought the World War Two base in 2013. Local residents welcomed the scheme but said future development should focus on creating jobs. The authority bought the 600 acre (240 hectare) former RAF Coltishall site for £4m and planned to develop it to attract jobs and new business enterprise. The first phase, which is now generating power, was built in 10 weeks by a workforce of about 200, operating seven-days-a-week. Proposals for a second phase to generate a further 18 MW are likely to be considered in the autumn. Norfolk County Council leader, George Nobbs, said: "We are guaranteed income over the next 25 years but not only this, the scheme is creating cleaner energy, saving 15,000 tonnes of CO2 per annum. "The scheme is now up and running and I look forward to seeing sheep grazing under the panels within the next few weeks."